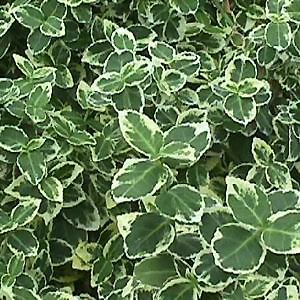 The Euonymus 'Emerald Gaiety', Euonymus f. 'Emerald Gaiety', has deep green leaves edged in sparkling white. The leaves are tinged with pink in winter. This evergreen shrub has a dense erect habit and is excellent for small hedges and foundation plantings. Plant in full sun. Emerald Gaietys can become a climber if supported. It does not like high winds but is otherwise very hardy. It does well under most light conditions from full sun to fairly deep shade. The flowers are easy to miss, but it can produce quite showy red inedible berries.